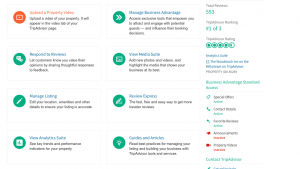 TripAdvisor is Making Some Changes to Thier Platform - How Will This Affect Innkeepers? 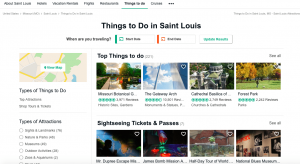 Last week TripAdvisor announced it will be expanding the role social media has on its platform both in providing content and in influencing people’s activities by providing personalized travel feeds for users. The new format will feature content and reviews from specialized brands, social media influencers, publishers and friends. “Members planning a trip to Paris may see a food critic’s article on the best restaurant in the city, an influencer’s travel guide of “must-do’s,” and a friend’s review of a new hotel near the Eiffel Tower,” explain TA experts. People will be able to create ‘Trips’ which can include in-depth travel guides, itineraries or simply a list of things to do while traveling. These trips can be kept privately, or shared with the online community. The 500 brands partnering with TA are already creating content for the site, although there is no information from TA, at this point, about how this content will be prioritized, vetted or displayed (i.e. will brand businesses need to bid, and provide content, to be on the feeds? ), but it’s a good bet the “brands” will be well-represented. Already, companies such as National Geographic and TheKnot are signed on. Members can follow their favorite brands, so the feeds will show up on their travel page. Go into your Management Center – on the right of that home page are these options. In this example you can see the special offer is active, but the announcement is inactive. Simply click on the link and fill it in. It’s suggested that you, make these seasonal, at minimum, but it’s more effective if they are monthly offerings. They do NOT need to be discounts – highlight the things that set you apart: the delicious, fresh breakfast you make for guests, or a glass of wine upon check-in. You don’t need fancy codes or anything, just make it redeemable upon check-in and then just do all the things you already do as gracious innkeepers. Free onsite parking and wi-fi are also great announcements you can feature. This area is found along the top header, under the “About” tab. 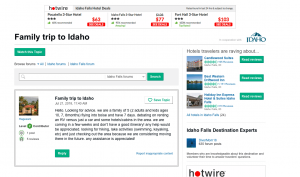 In the sample below it’s “About Idaho Falls.” The Forum option appears on the right, under lodging, things to do, etc. 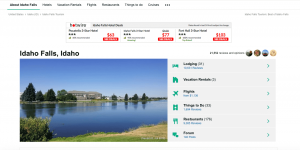 Forums are far-ranging in topics, but as you can see, other properties are being featured on this page. Rather than pay TA money to be featured, simply be active and engaged with the user asking the question – and everyone who reads these forums. Time will tell if these changes will have a large effect on what seems to be an outreach to the Millenial travel market. Innkeepers can start to take action right away to help promote their businesses in this new foray into “social-assisted travel”. Thank you to Theresa Keegan, who contributed the vast majority of this content.